This paper reviews how several developing countries which can be considered successes (with qualifications) have progressed economically, briefly capturing what policies and institutions might explain their performance. The analysis considers Mauritius, South Korea, Ecuador, Cuba, and the Nordic model/Norway. It also briefly considers Chile – a country whose ‘success’ is sometimes explained by neoliberal policies – and Botswana – often held up as Africa’s most successful developer. 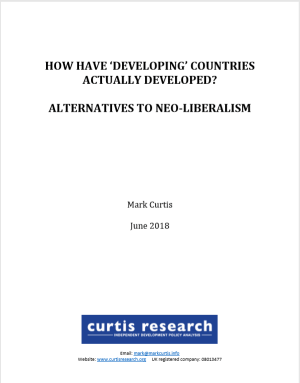 In recent decades, the British and US governments, in particular, have largely promoted neoliberalism in developing countries as a supposed strategy to reduce poverty and promote economic development. Perhaps better described as ‘market fundamentalism’, neoliberalism has tended to involve: privatising key areas of the economy; reductions in state spending and the general role of the state; de-regulation of the financial sector and of corporate activities (relying on voluntary ‘corporate social responsibility’); strong promotion of foreign investment with few barriers, often accompanied by cutting taxes, promoting tax incentives for foreign investors; and failing to address rising inequality. Some of these policies are beginning to change, given the obvious failures of this model, but its general thrust is often still in evidence in the economic policies and aid strategies (not to mention domestic policies) of Western states such as the UK and the US. Countries which have successfully developed in the postwar world do not owe their progress to neoliberalism. It is more accurate to say that the kinds of policies promoted by relatively successful states have generally tended to involve the opposite: a strong, interventionist role for the state; privileging domestic over foreign investors; liberalising only once the domestic economy and local firms can compete in world markets; periods of trade protection; and explicitly pro-poor state spending. Supporting Small Businesses in Developing Countries: Which Programmes Work and Why? This study examines how governments and donors can better promote ‘business enabling environments’ so that small and medium-sized enterprises (SMEs) can contribute to inclusive economic development in developing countries. It focuses on ‘what works’ and contains a review of literature on SME support plus three case studies. Despite a substantial literature on business development, remarkably little is known about which SME support programmes work and why. There is significant funding of SME support programmes by multilateral and bilateral actors but much of this is focused on providing financial loans to SMEs and advocating general reforms to the investment climate, which mainly benefit larger enterprises, including multinational companies, rather than SMEs. Other support programmes are often neglected. This study challenges these approaches and suggests alternative support policies. Gated Development: Is the Gates Foundation Always a Force for Good? The Bill and Melinda Gates Foundation (BMGF) is the world’s largest charitable organisation, with an asset endowment of $43.5 billion. In global health and agriculture policies, two of its key grant areas, the BMGF has become probably the most influential actor in the world. Bill Gates himself has become probably the single most influential voice in international development. But the BMGF’s increasing global influence is not being subjected to democratic scrutiny. Further, this study shows that the BMGF’s programmes are – overall – detrimental to promoting economic development and global justice. The world is being sold a myth that private philanthropy holds many of the solutions to the world’s problems, when in fact it is pushing the world in many wrong directions. In 2013, the Norwegian government began to lobby for certain ‘clarifications’ to the OECD Guidelines for Multinational Enterprises – the main principles that encourage companies from OECD states to behave responsibly. This lobbying followed an investigation into Norway’s giant Pension Fund related to its investment in South Korean steel manufacturer Posco, which concluded that the Fund had violated the OECD Guidelines. Posco’s project in Odisha, India, is threatening to displace 22,000 people and has been condemned by no less than eight UN special rapporteurs. This report analyses Norway’s stance towards the Guidelines and recommends how the Pension Fund should improve its human rights due diligence. This report asks: how ethical is Norway’s foreign and development policy? It shows that the government has taken an important ethical lead on some international policy issues but that, overall, Norway has lost its ethical niche. Contains analysis of the Pension Fund, oil industry, arms exports, Norwegian corporations and policy towards the World Bank. This report reviews the British government’s arms exports policies since 1997, showing how it continues to arm persistent human rights abusers and states enduring conflicts, how the arms trade remains mired in secrecy, and the foreign policy benefits of arms exports. This report documents how over a dozen UK companies, including several household names, are abusing human rights around the world. This analysis documents China’s arms exports and military relations with African countries, especially human rights abusers, and offers reasons for China’s increasing involvement on the continent in rivalry with the US and Britain.